83. Raymond GREGORY was born on 24 Dec 1914 in Lone Wolf, Kiowa, Oklahoma. He died on 9 May 1989 in Salem, Marion Co. Oregon. He was buried after 9 May 1989 in Salem, Marion Co. Oregon. 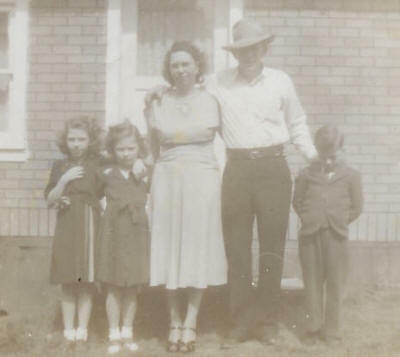 Raymond GREGORY and Doris Elena WOOD were married in Toledo, Lincoln, Oregon. Nancy, Peggy, Doris, Raymond and Art.